Near the center of the walled city is the largest and most important temple, Wat Mahathat. 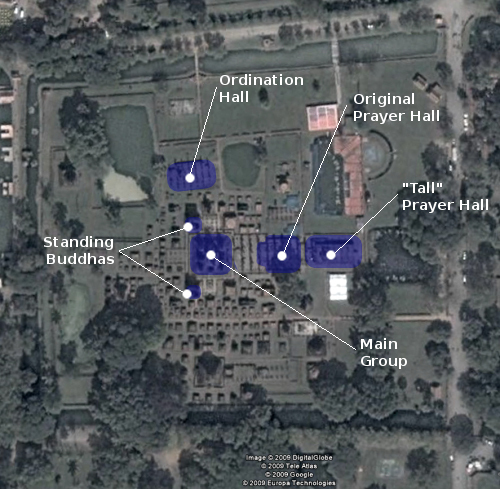 The huge almost square complex once held five ponds, ten prayer halls and around 200 stupas (chedi). Exact construction dates are not known, but the temple was most certainly built and expanded over the course of many years. The main construction was probably done from the late 13th through to the mid 14th centuries, but like many Thai temples, Wat Mahathat was continually modified and added to up until the old city was abandoned in the 18th century. As with almost all Thai temples, the main axis of Wat Mahathat lies along an east-west direction, with most of the main buildings, and their Buddha images, facing east. At the very 'front' of the complex is what is commonly called the "tall" prayer hall, for the height of its platform and columns. At the rear of the platform is a large Buddha image in the quintessential Sukhothai style. Behind the tall prayer hall to the west is the original prayer hall, now just a forest of slender stone columns. Directly in line with this is the main tower group. The slender lotus-bud central spire is surrounded by eight shorter stupas and prangs. The whole piece is a blend of Lao, Khmer and Mon styles. The main tower group is flanked by two mandapas tightly enclosing large standing Buddhas. This type of structure is somewhat unique to Sukhothai, where standing Buddhas also appear to have been a bit more popular than they were in later periods. Near the northern edge of the complex are the remains of the ordination hall. A small stone platform supports an elegant Buddha image.